What are the Connection Bridge files and how to download them? Connection Bridge files are used to establish a connection between your shopping carts and make the data exchange possible. They are special access gateways that are completely secured by unique Security Tokens bounded to your personal account and provided by Cart2Cart. To work correctly, Connection Bridge folder needs to be located in your store’s root folder. 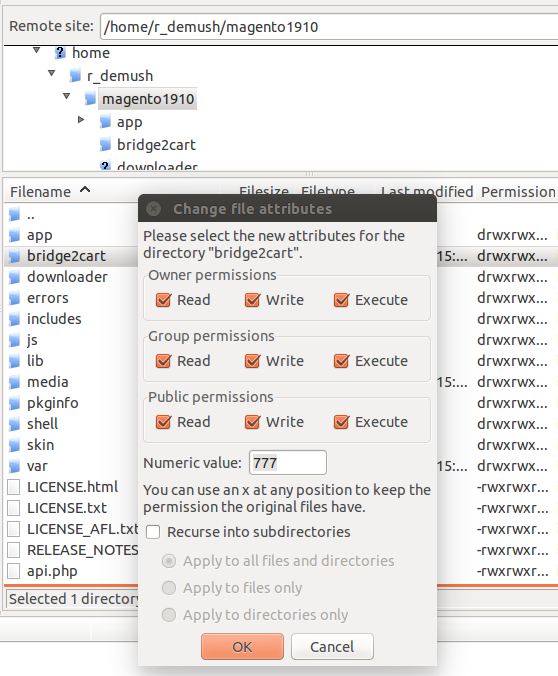 After creating a migration you’ll find yourself on the “Setting Up” Migration Wizard Step, where you’ll be asked to provide the URLs of your Source and Target shopping carts, and download the Connection Bridge files (only for self-hosted carts e.g Magento, WooCommerce, PrestaShop, etc. For hosted shopping carts e.g. Shopify and BigCommerce, you'd have to provide additional API info instead). 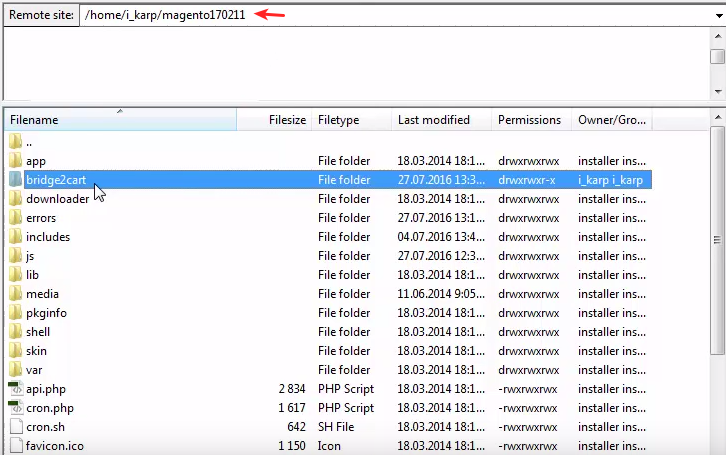 This video demonstrates the procedure of the Connection Bridge installation for Magento. However, it’s as well applicable for all self-hosted shopping carts. How to install Connection Bridge files? 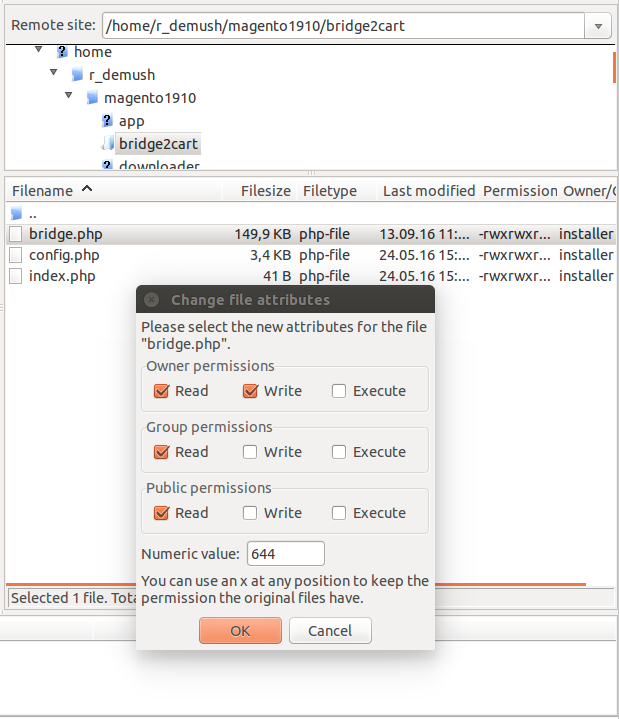 The procedure of Bridge installation via FileZilla FTP client is identical for macOS, Windows and Linux users. There are two ways to set up Connection Bridge - manual and automatic. By default, you’re offered to do it manually. 1. Download Connection Bridge files. After you provided your Source / Target store’s URL, download the Connection Bridge. Save the zip file on your hardware and extract it. 2. Upload the folder to your Source / Target store via FTP. Whichever FTP client you are using (FileZilla, WinSCP, FileFTP, CuteFTP) enter the root folder of your store and paste the bridge2cart folder you extracted from the zip file previously. 3. Check whether Connection Bridge files have been installed correctly. Click the confirmation link to ensure you’ve set up Connection Bridge properly. If you see this message “BRIDGE_INSTALLED” - Connection Bridge is working correctly and you can proceed with the next step of Entities Selection. Provide your FTP details - host, port (If it’s different from “21”), login, password and the path to the folder where your store is. Q: I’m clicking on the link but “BRIDGE_INSTALLED” message does not appear. What shall I do? If you are using other FTP client, change permissions in the way that’s appropriate for it. Q: Aaugh, it still doesn’t work! A: No worries, we’re sure your issue is easily resolvable. Please, describe your problem in details and submit a ticket so that our Support Team could give you a hand. Connection Bridge exists for one purpose only - making the data exchange possible. By installing it you allow our service to copy, and by no means modify, the data you’d like to move to a target store. Once the migration is done you can delete Connection Bridge. Note! We strongly recommend to turn off your website redirects to ensure proper functioning of the Connection Bridge files. Go to "http://[yourstore url]/bridge2cart/bridge.php" to check if you need to turn off the redirects. If the link is redirecting you to another location, disable the redirects in your .htaccess file, a hidden file residing in your "shop" folder. Please, do not remove Connection Bridge files from your FTP during the data transfer process. Otherwise, we can't guarantee proper migration results. You will be able to delete Connection Bridge files right after your store migration is over.